Recipe results are integrated with Bing’s traditional SERPs. 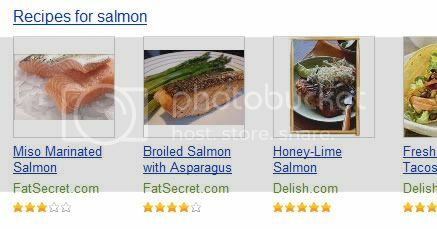 A search for ‘salmon‘ returns a standard results page which contains a link to ‘Recipes for salmon‘ and thumbnails of several recipes it has indexed. While Bing recipe search is a minor feature in the overall scheme of things, it’s yet another reminder that search engines are adapting to consumer needs. In an effort to help consumers more efficiently find information on the web, search engines are moving beyond standard SERPs and providing specialized interfaces for specific types of information. To make the most out of this, of course, search engines and content providers have to work together so that the right data can be aggregated and displayed. But clearly search engines are betting that the potential rewards of this extra work outweigh the costs. When it comes to search engines, Google, of course, isn’t standing idly by. It has been participating in the verticalization trend too. For better or worse, however, Google’s early forays into potentially lucrative verticals potentially put it in direct competition with some of its own advertisers. While the outcome of this remains to be seen, the logic behind verticalization in general is solid: as consumers become more sophisticated information seekers online, one-size-fits-all search just won’t cut it. The largest search engines can either get into the action and take advantage of the trust they’ve built up with consumers, or they can let upstarts build the market. All signs are they’re not interested in that, so the only question now is what verticals Bing and Google will enter next. What drives your strategy for web design? I read an interesting article on usability and user experience posted recently on this site by Tom Stewart, the Chair of the sub-committee of the International Standards Organisation (ISO), which is responsible for the revision of ISO 13407, the international standard for Human Centred Design. We are in the process of redesigning our site for a new platform being developed for release later this year, and the aforementioned article got me thinking about the planning for the design of a website. An effective and easy to use navigation system is essential for any site and can be the difference between making a sale and losing a customer. The navigation should be easy to find and use, and should work consistently across the site. Make users work too hard and you risk losing them to another, more usable rival.